Moderation mode was introduced in Instagram Feed Pro version 2.4 to create a more visual way to moderate feeds. Using this feature allows you to preview feeds before allowing individual posts to show up to visitors and create a list of specific posts you’d like to display in a feed. Here is how you can use this feature. First, enable moderation mode for a feed. This can be done for all feeds by selecting Visual for the Moderation Type setting on the “Customize” tab. You can also enable this for a specific feed by adding moderationmode=true to the shortcode. A button to enter moderation mode will now appear to logged-in admins (this will not appear to visitors) on the front-end of the site at the top of the feed. 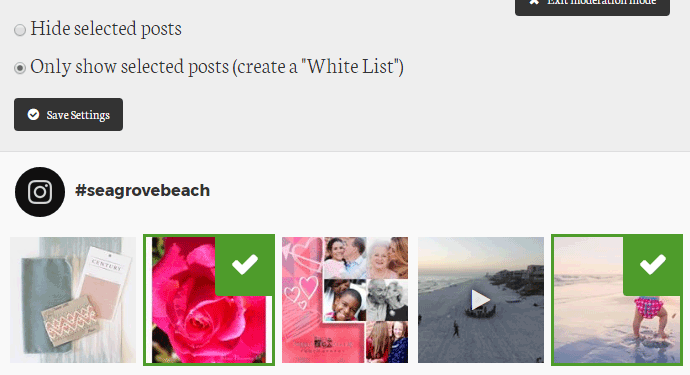 To create a white list that will only display posts selected, start by selecting the Only show selected posts (create a “White List”) option. Then click the images of posts you want to approve. i.e. [instagram-feed whitelist="favorites"] then you will be given instructions on how to use your newly created list in a feed. 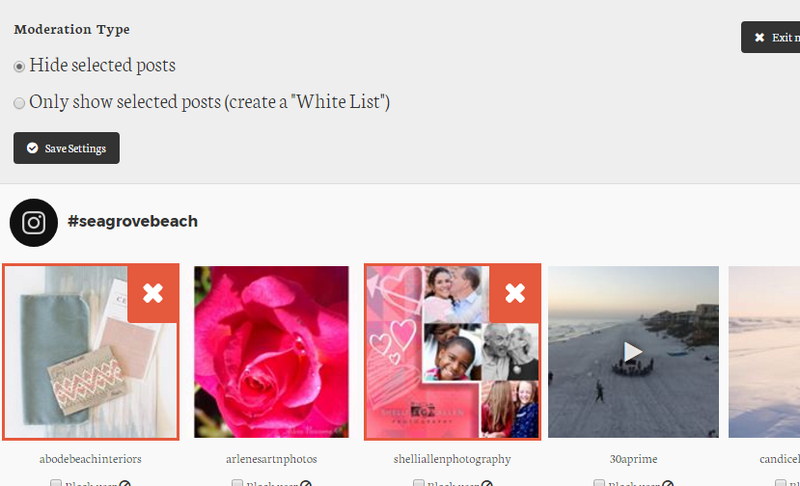 Once you add the white list id to the shortcode, only posts you’ve selected will appear in the front-end of the feed. You can continue to update this list as needed by repeating these steps. *Note: If this feed never needs to be updated (you never need to change the posts included in your list) it’s a good idea to make it a “permanent” feed by checking the checkbox labeled This is a permanent white list (never needs to update). You can also add the setting permanent=true to your shortcode to make a feed permanent. To use moderation mode to hide specific posts, you would want to make sure the option to Hide selected posts is selected. Then click on the images of posts you want to remove. Save your settings when done. No further action is needed and these posts will no longer show up in your feed on the front-end of the site. Need help using moderation mode? Please contact support with questions.